A thread to show off your bases. Below all that is the real thing. 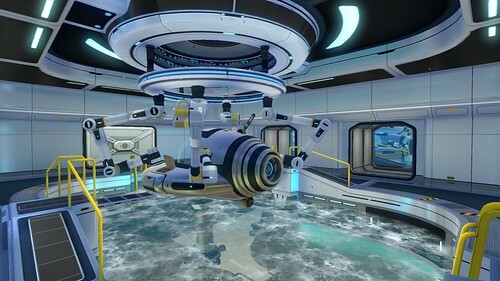 Aurora Personnel Only base with R&D Tower including Engineering, Lab and Observatory. The view of the Biome is quite nice, not to mention there are some nice caves going down 300m close by. The Tower is not accessible on every level. There is so much space that some floors are reinforcement only. I hated having a ladder in the middle of every floor also, so some levels use external tubes with ladders (we need an elevator now we have towers). Improvements to the Jelly Shroom Relaxation Station! 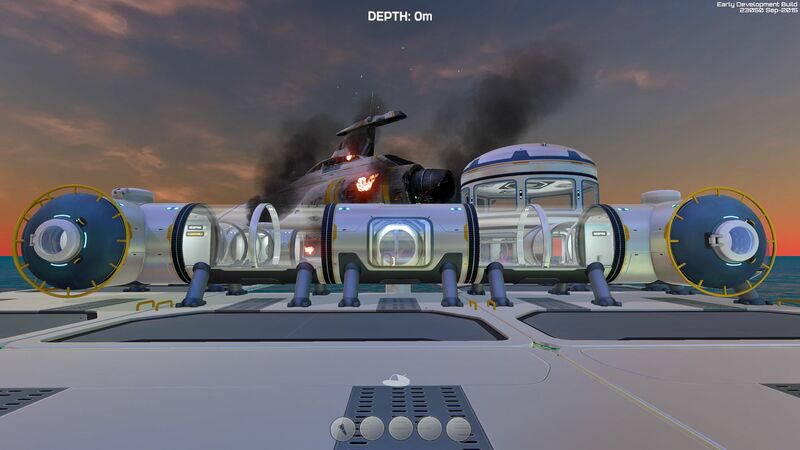 Modules from left to right: Captain's Quarters w/ Observatory bedroom, Observatory, Meditation Chamber, Track. WHAAAAAT!?! I have to go try this. Probably end up rebuilding half my stuff. EDIT: Well, tried and failed. It still only allowed me to place it in the center of the room. As long as a another dome is above or below and area isn't obstructed is should place. This might have been the problem, I think I had lockers below where I was trying. I will try it again, thanks. And it also only works on experimental mode. Ah, that is why. I'm not in experimental mode. Thank you. Not necessarily. The doors open, you go in and choose floor, doors close, momentary up down noise, then door opens at requested floor. All they really have to do is respawn you in another spot, no physical movement of the elevator is needed. That's because you build too big too fast. 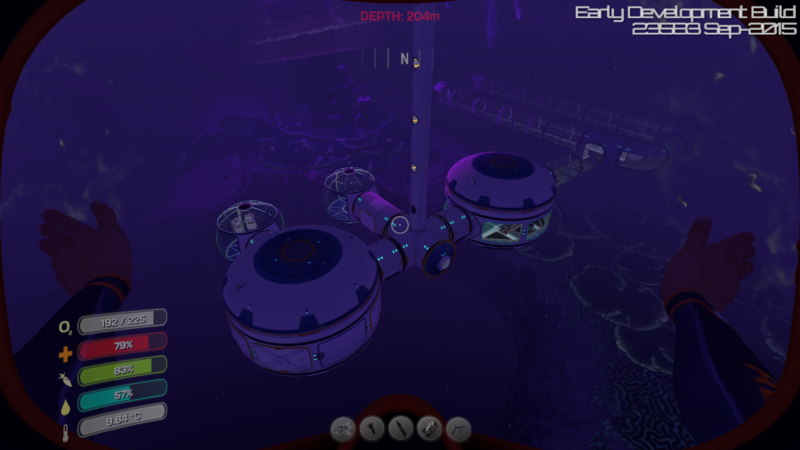 I just place as much as I can as fast as I can so I can get in the base and do all the work from inside where it is safer. To let me get air I just make sure I keep at least 1 area free of water. The only parts I have to "build" from outside are the rooms. I am hoping they add the stairs that I saw somebody draw up (they use 2 spaces in the large room along the outer edge and follow the curve of the outer wall), because then we could "walk" from one level to the next instead of teleporting by ladder. 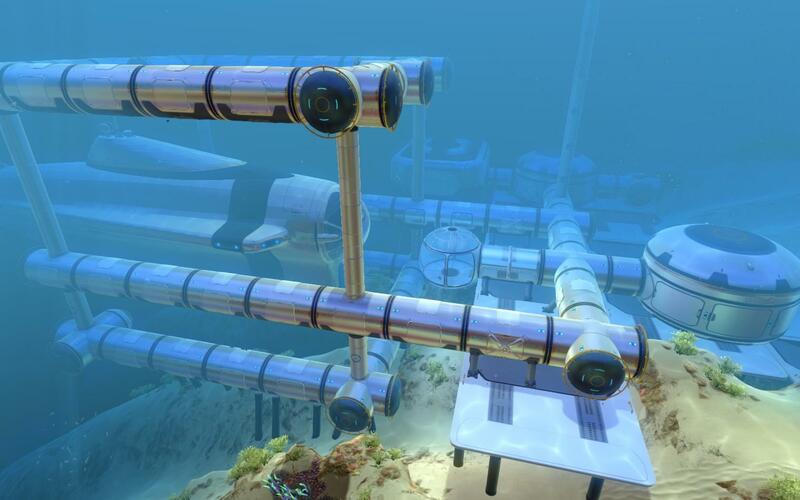 This would also give us something more to fill the empty areas of our bases. 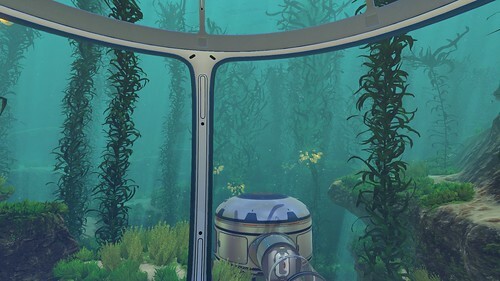 By using the stairs (if they add an inner wall to them) we could possibly even have a bulkhead door at the bottom of each set of stairs to hold back the water. 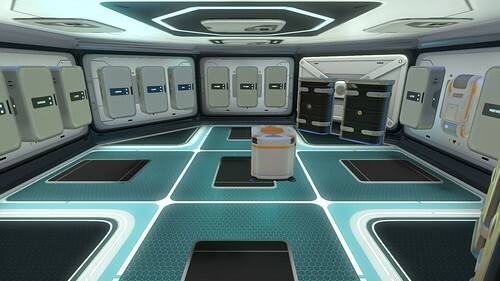 I am also hoping that they add more furniture to the game so we can have tables, chairs, desks, cookers, beds, lamps (able to turn on off inside lights on the base), couches, (possibly even a fake TV that just shows a slide show or a static image), windows with closable curtains (or guards so that when we add the guards to the window it restores the integrity we lost from the window), Another thing I am hoping they add is the ability to mount a bulkhead door to the outer walls like we do the hatches to let us have a more realistic airlock for getting in and out of our bases. You gotta build your base bit by bit. Funny this thread came about, I just finished mine in a creepvine area and came over here to share. 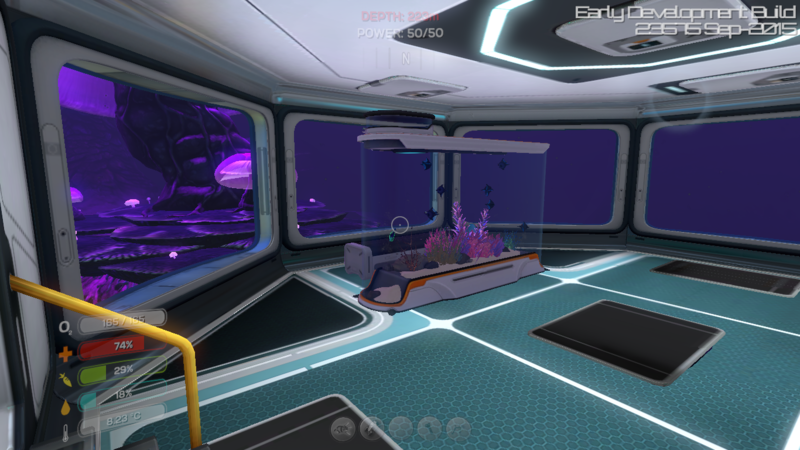 I had a base on the new northern islands, but I decided that I didn't like the location with the biter fish around and although there was a reaper nearby when I first starting setting it up, he disappeared shortly after. Not sure why? 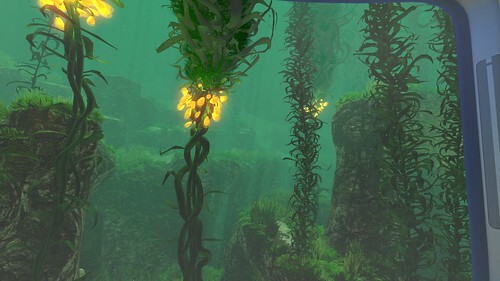 Anyway, I really like the creepvine area, especially with the glowing seeds, so I moved. All set up now, you can see most of it in this shot. 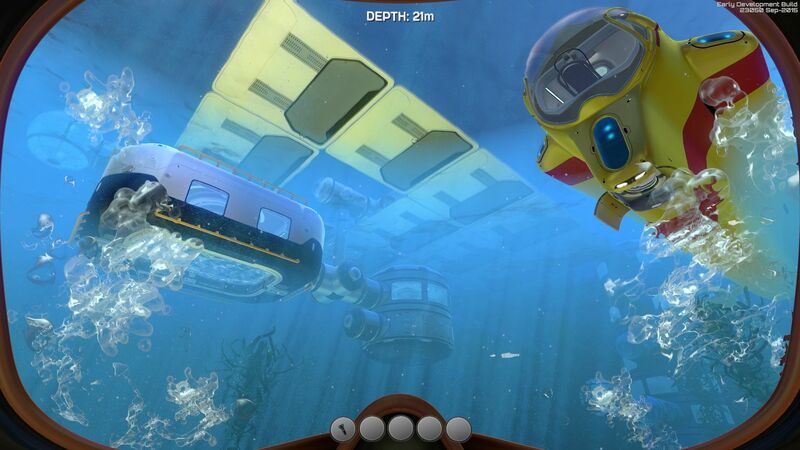 Here's a shot with the Moonpools. View out both sides of each top observatories. Lockers for Medical, Wet Suits and Tools at the main entrance. Looking up towards the observatories. 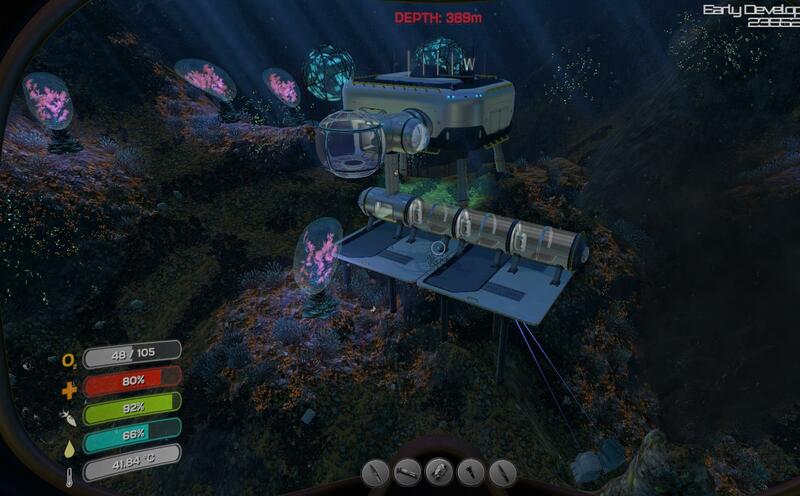 My fish tanks which are set up for fun right now but when I decide to play in survival mode they will hold my food. The front view outside the same room. And my workshop. All the storage I could ever need! I always end up building 4 foundations so they are spaced out just enough to let me place a room in the middle of them (like an X) and end up with 1 room in the ground with nothing but reinforcements all round. 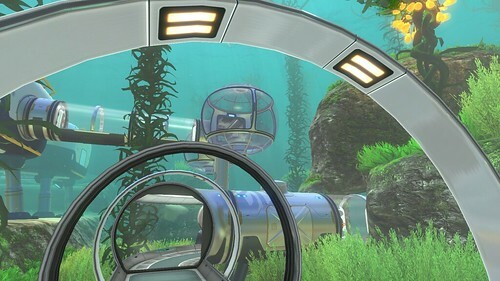 The next room up (at the level of the foundations) is what connects everything then I have a glass tube ring going around the outside so that I end up with 2 X corridors with one used for my main airlock room (straight glass corridor) hatch and the other has a regular tube connecting to the moonpools (I have 2-4 straight corridors attached in a line so I can have 1 X corridor then 1 more straight before it ends in an observatory with 1 moon pool to each side of the X corridor) that are on the edge of a cliff or other steep hill. I then have a set of straight corridors stacked (so that if there is a flood it will pass through because the vertical connectors don't let it pass through yet) to let me go up/down 1 level at a time. Every level has a set of windows to let me see where I'm at and a bulkhead door so I can stop the water from passing beyond that point. 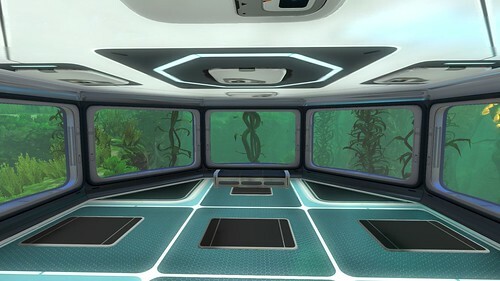 I have my bulkheads set up so there is 1 for every 2 corridors/rooms (except for the glass corridors). 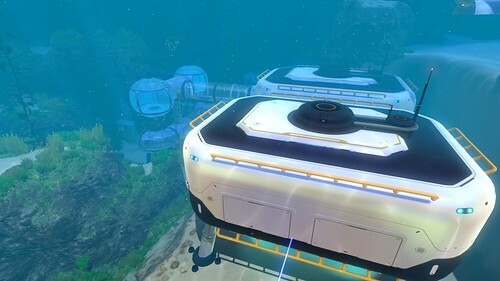 I also build my bases so that if one section is flooded I can close it off and go around to the other side of it without having to go outside the base. 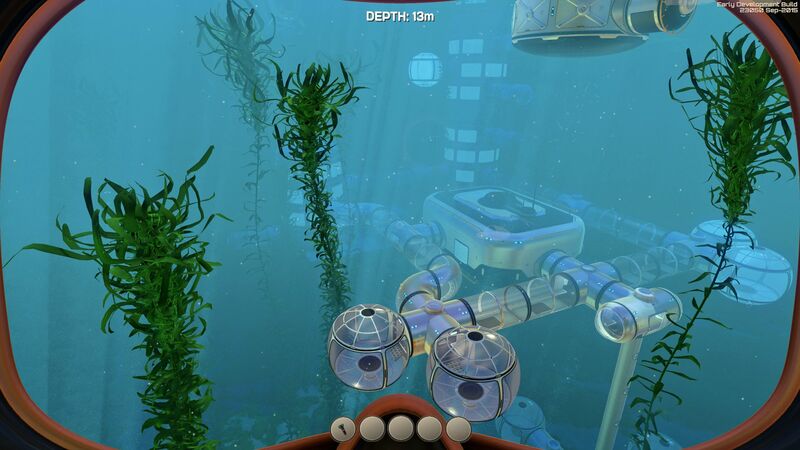 (I currently have 3 paths to go from my main airlock to the moonpools.) 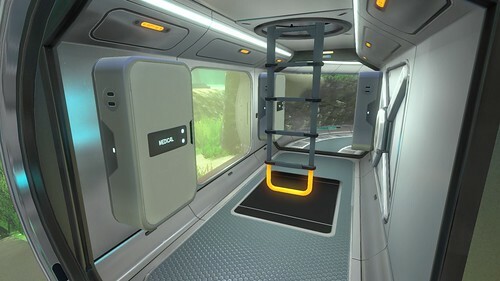 I also build so that no more than 2 levels are connected by ladder without having to walk from one corridor to the next so I can keep the pattern of bulkhead-2 rooms-bulkhead. This also lets me bypass the main level X corridors by going up to the next level then coming down on the other side (if it floods). 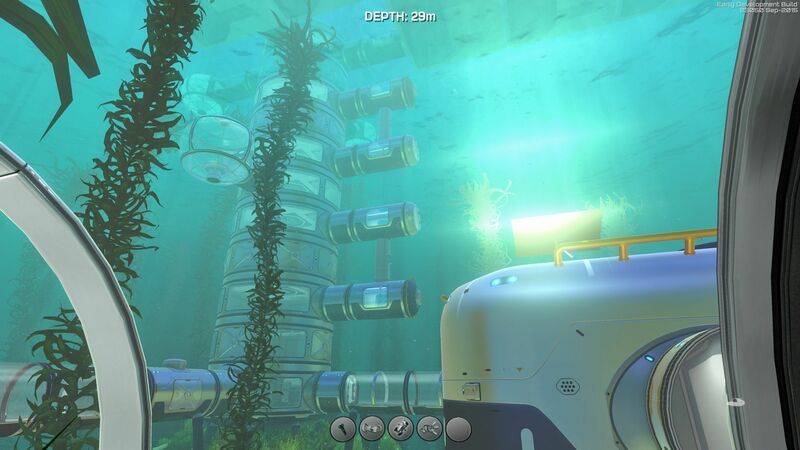 Is there a tutorial for base building? 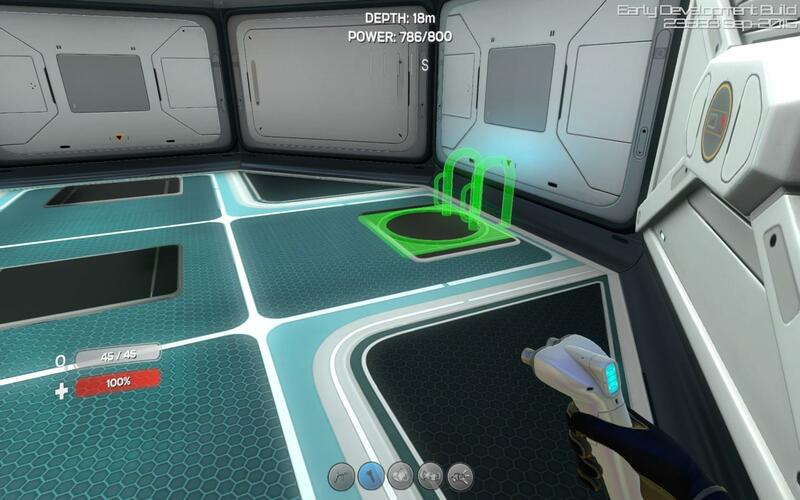 I can't work out how to make some things work like vertical connectors, or connecting corridors to the moon pool. With your Builder, aim at a junction point after selecting which item you want to build. So with a vertical connector, aim at the top or bottom center of a standard tube, or the unconnected end of your last vertical tube. 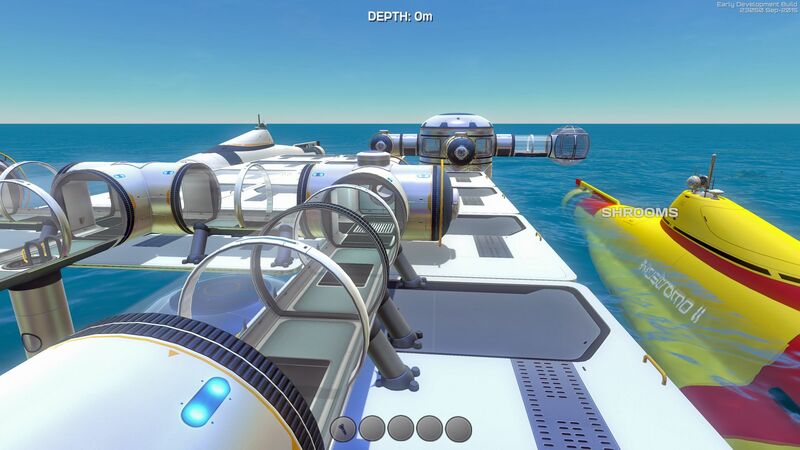 For the Moonpool, aim at its sides or ends until your tube turns green, then rotate as needed. 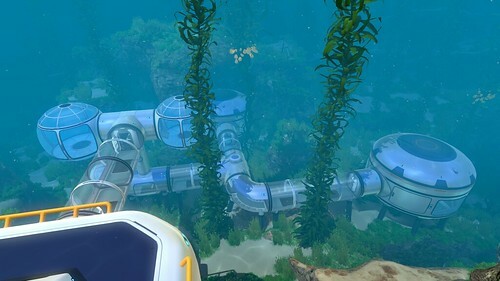 If placing a pool, you have to aim at the end of the tube you're trying to connect it too. I like to build bases at the stragest locations. 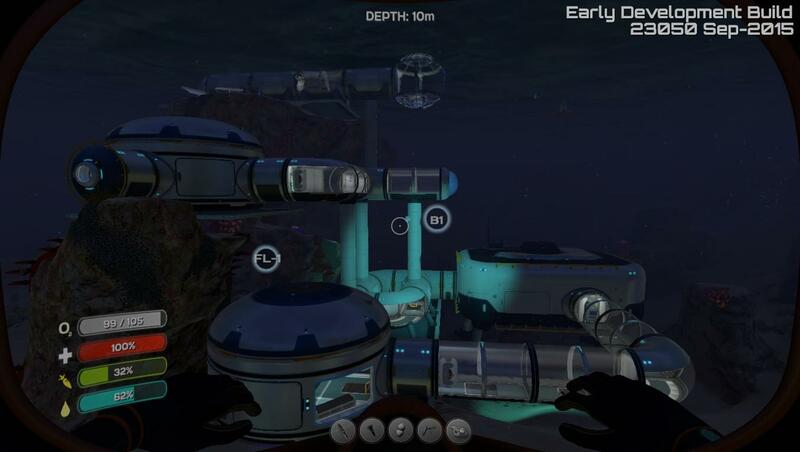 This is my current main base, the location isn't that strange except its quite a stretch from the starting area for a main base. Its at the junction of SparseReef, GrandReef, Kelp Forest and Grassy Plains, there are lots of resources near and its a relatively peaceful area. 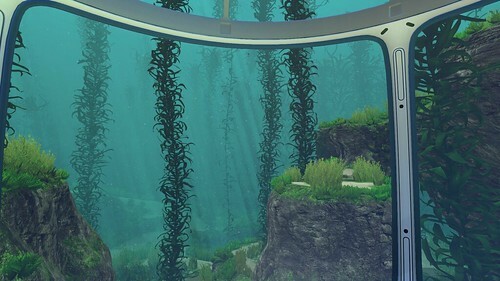 The fish farm has 8 aquariums filled with fish where I am allowed to "take fish from" every day (in reality I use the debug console) It also has a seawater desalinization device. Edit: This is not a real desalinization device its a "desalinization device". Its just two lockers filled with salt and coral pieces plus a computer chip and a wiring kit. (So that I am required to put some effort in it) Then I use the debug console to spawn disinfected water while standing in front of it. 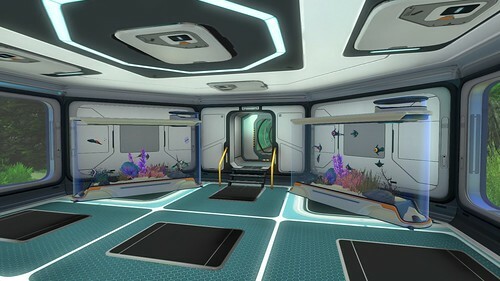 Crafting has a fabricator and lots of storage and habitation has a bed (actually two benches) and a few lockers. This is where I pretend to sleep. This is the Tree House as I call it. 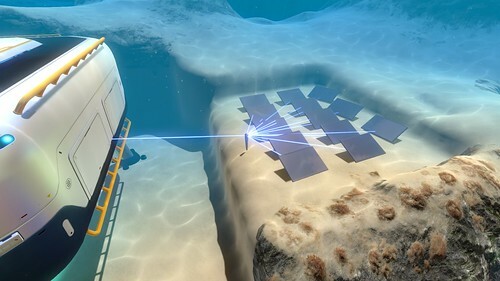 A moonpool was not necessary as the base is close enough to the surface to allow solar recharging. 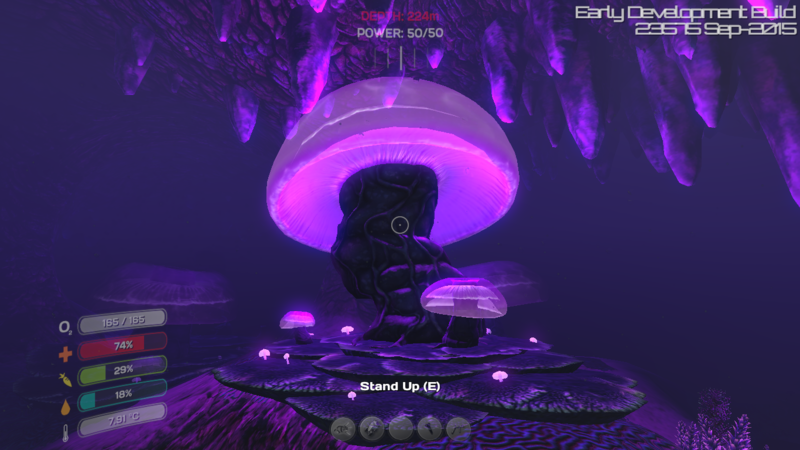 There are just a few basic items in the base as the Mushroom Forest isn't really rich in resources you actually need. This was built inside the Giant Coral Tree, its my secret hiding place if I need some solitude. :-) It would be even more secret if there were no air pipe and energy transmissions leading there. The base has a replicator, a locker and a bed. Spartan, but effective. 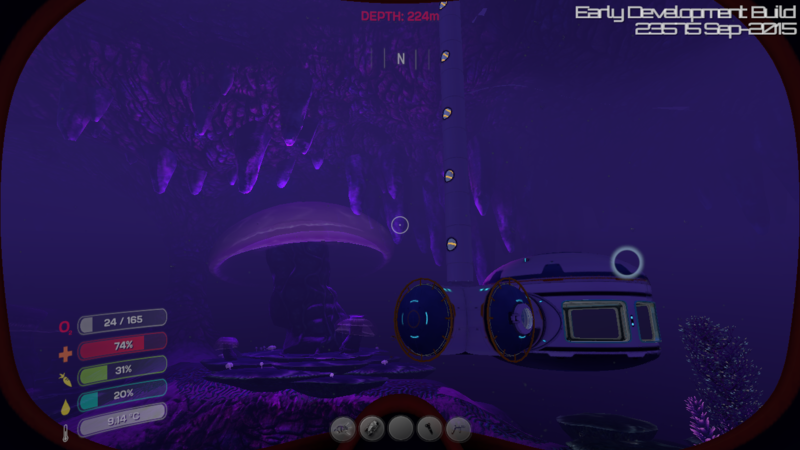 The caves in the mountain biome are far larger than they seem to be when entered with the Seamoth. The base is in fact dwarfed by the cavern. How nice of the devs to put a smoker inside, so we can have thermal energy. 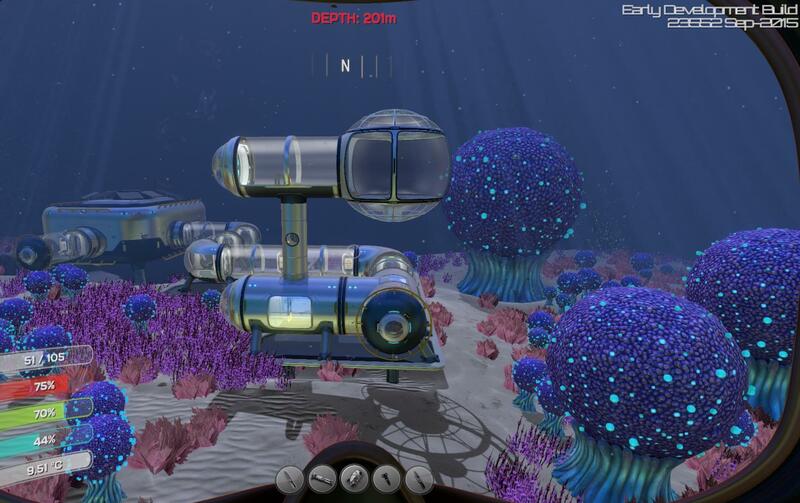 I also built bases in the Deep Grand Reef and inside the Jelly Mushroom Caves but since those are no architectonical wonders and the thread already has images of bases in these locations I left them out. Vertical connectors go on the top of the corridors, then you have to have a corridor at the top before you can put a ladder in.